Can I email contacts created from Conversations? What happens to visitors who leave a chat before they submit an email address? 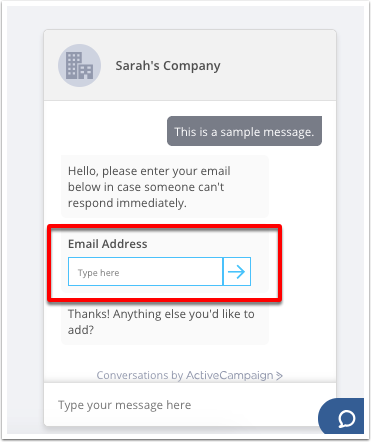 You can use the Email Capture Form to collect email addresses from visitors when they initiate a chat with you. This Email Capture Form will appear in the chat widget and will only collect the visitor’s email address. Once the email address is collected, a contact profile will be created for them in your ActiveCampaign account. All interactions will be stored in the Conversations unified inbox and on contact profile pages under the Conversations tab. Visitors will need to submit their email address in order to be added to your ActiveCampaign account as a contact. The Email Capture Form may have been enabled when you set up Conversations on your account. If this step was skipped during the initial setup, you can always go back to Conversations Settings and turn it on. The Email Capture Form will appear after the auto-reply message (if using) in a chat conversation. Once a contact submits their email address through a chat, you can add them to an automation using the “Submits Form” trigger. Note that if the email address already exists in your account, a duplicate contact record will not be created. An inbound email is a single unique email address that will route emails into your Conversations inbox. With this email address, you can forward emails from your personal email client and collect replies to campaigns and automation emails. When you receive an inbound email from an unknown email address, we’ll create a contact profile record for them in your account. The conversation will appear in both the unified inbox and on the contact record under the “Conversations” tab. For example, if the visitor is logged into a page on your site, you may be able to identify them after they log in. Once their email address is passed to the code, any message they send will be associated with the contact matching that email address. Can I email contacts created from the Email Capture form? While contact records are created when visitors submit the Email Capture Form, they are not considered opted-in contacts and are not added to any email marketing lists. This is because they have not explicitly provided their consent to receive marketing communications from you. If you wish to invite the contact to subscribe to your list, you can supply a link to your online subscription form to them via chat or add them to an automation that sends a follow-up email and includes a link to your subscription form. Note that this follow up should be treated as a transactional email and should only relate to the discussion you had with your contact. What happens to visitors who leave before they submit an email address? The chat widget code you place on your site also places a tracking cookie on site visitors. If they initiate a chat and leave without submitting their email address, that conversation is still captured and stored in your Conversations unified inbox. If the visitor comes back within 30 days and does not clear their cookies, we’ll associate that visitor with their previous chat. If they submit their email address, a contact profile page will be created for them and their interactions will be listed on their record. How do I get chat to appear on certain pages of my site?